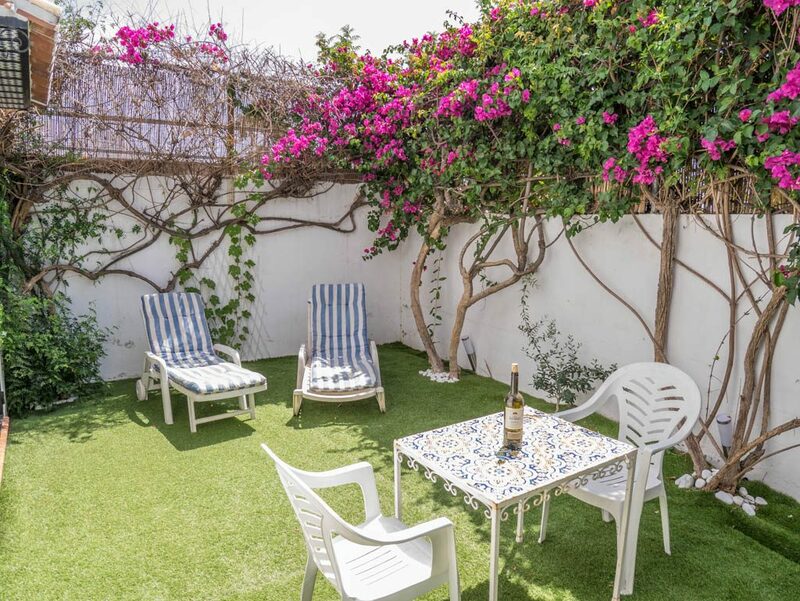 Welcome to our home “Casa Anduez”, tucked away in a private passageway in the town centre of Nerja, close to shops, bars, restaurants, beaches and the famous Balcon de Europa. The house itself is a modern recently renovated 3 bedroom 2.5 bathroom, semi-detached house with private garden, smart fully equipped kitchen and everything else you need for an enjoyable stay in Nerja. The house sleeps up to six people, but can be rented as a two bedroom property at a reduced rate, for two to four guests if required – please ask. 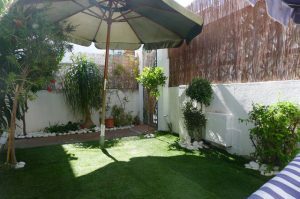 The property has air-conditioning in all the bedrooms for a comfortable nights sleep in the hot summer months, internet and British satellite TV in the lounge and sun loungers and dining table outside to make the most of the good weather here. The house is approached down a private residential passageway of only 12 semi-detached houses. The front gate opens onto the front garden and covered side terrace. Starting on the ground floor, there is a large modern white Shaker style kitchen fully equipped with electric oven, hob, fridge/freezer, washing machine and dishwasher. Plates, cutlery, pans, cups and glasses etc are all provided for six people. 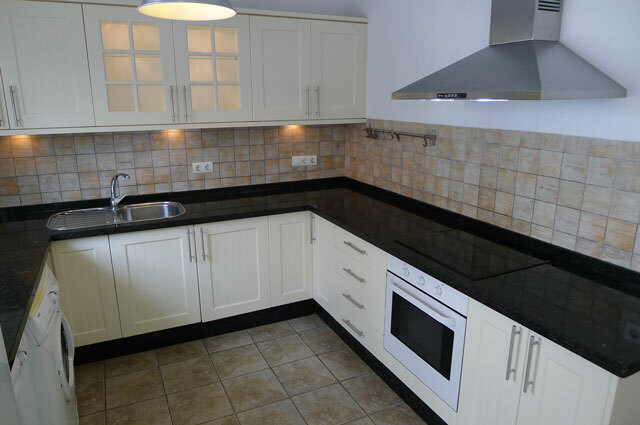 The kitchen also has a microwave oven, electric kettle, toaster and a juicer. The kitchen door leads out onto the pretty front garden, with fruit trees and other tropical plants. This garden gets the sun from early afternoon until the evening in the summer. Also on the ground floor is the lounge, which runs the full width of the house. The lounge features a working fire place as well as a Panasonic wall mounted heating/cooling energy efficient air conditioning unit for year round comfort. The lounge (furnished with sofa and armchairs) opens via double patio doors onto the south-facing sunny rear garden, planted with mature bushes and buganvilla, which gives some shade during the summer as well as privacy from the neighbouring properties. A splash pool is also available on request for younger guests to enjoy. There is also a downstairs toilet with wash hand basin next to the lounge. Upstairs there are three double bedrooms (with two single beds in each), the master bedroom having an on-suite shower room and fitted wardrobe for storage. All three of the bedrooms have hot and cold Panasonic airconditioning units for cooling in the summer and heating in the winter months. The family bathroom is also on this level, with a full size bath (with shower head), wash hand basin, wc and bidet plus electric wall heater. 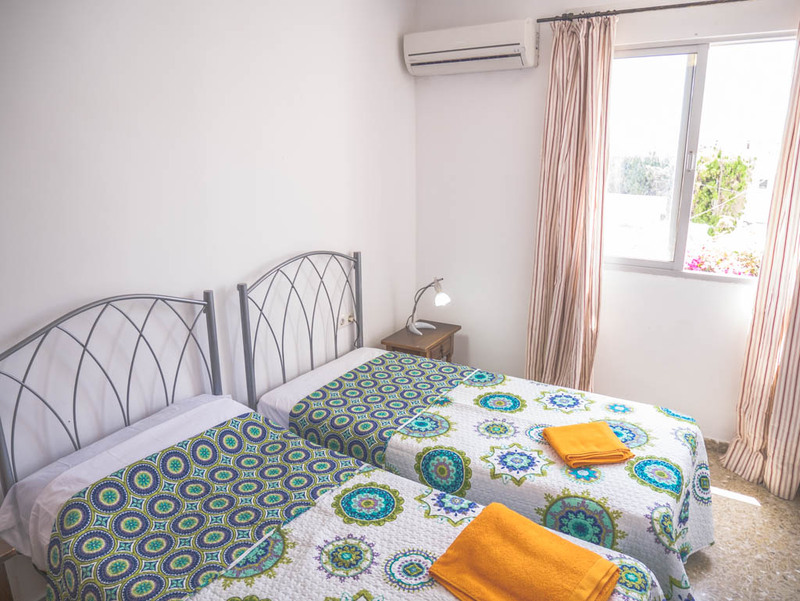 There is ample wardrobe space in each of the bedrooms, plus plenty of storage space around the side of the house for beach equipment, bicycles etc. Hot water is provided by an electric boiler and the cooker and oven are also both electric – there are no gas bottles to change in the middle of a shower in “Casa Anduez”. The house is in a mainly residential neighbourhood, with local shops, bars and restaurants all in the surrounding streets. You can cross the street to buy your bread from the bakers, visit the butchers and the fishmongers on the next street up and buy your fruit and veg from the greengrocers. There is also a small general shop next to the bakers, which sells all the basics you need. The nearest supermarket is Mercadona (one of a big chain of Spanish supermarkets) which is less than 10 minutes walk from the house, where you can find everything. There is also a British shop and a Swedish shop on Los Huertos, which is two streets down from the house (see the map below). If you don’t fancy cooking, you can choose from one of the local restaurants. Our favourites are Joannies on Plaza del Olvido, Taberna de Pepe on the street diagonally opposite the house and Puntillas on Calle Bolivia. All of these restaurants are within five minutes walk of the house. There are also Indian, Chinese and other international restaurants on Calle Los Huertos (two streets down) along with takeaways, including pizza, also on offer. The old town centre, with its narrow cobbled streets that lead down to the Balcon de Europa, are less than ten minutes walk from the house. There are more bars, restaurants and shops here, which tend to be more popular with tourists, rather than the local restaurants nearest to the house. 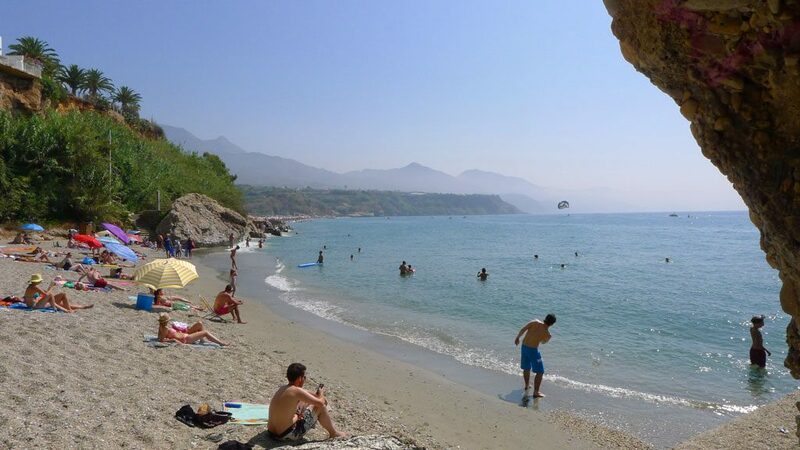 Burriana beach, plus the smaller coves along Calle Carabeo, is about 10 minutes walk from the house. 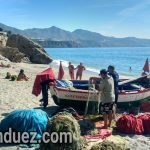 The town end of the beach is approached by steep steps down from the street above, but you can also take a slightly longer route to Burriana beach itself, which is entirely step free. El Salon beach, next to the Balcon de Europa, is a pretty sandy beach, again with completely step free access, making it especially suitable for people with young families. This is also about a 10 minute walk from the house. If you choose to hire a car, you can park for free on the surrounding streets if you can find a space. We also have a private parking space you can use, 5 minutes walk from the house, if necessary. With a rental car you can visit places like Frigiliana (15 minutes drive), with its whitewashed houses and winding cobbled streets or some of the spectacular beaches in the Maro natural park. Public buses are also available from the bus stop at the top of our street.